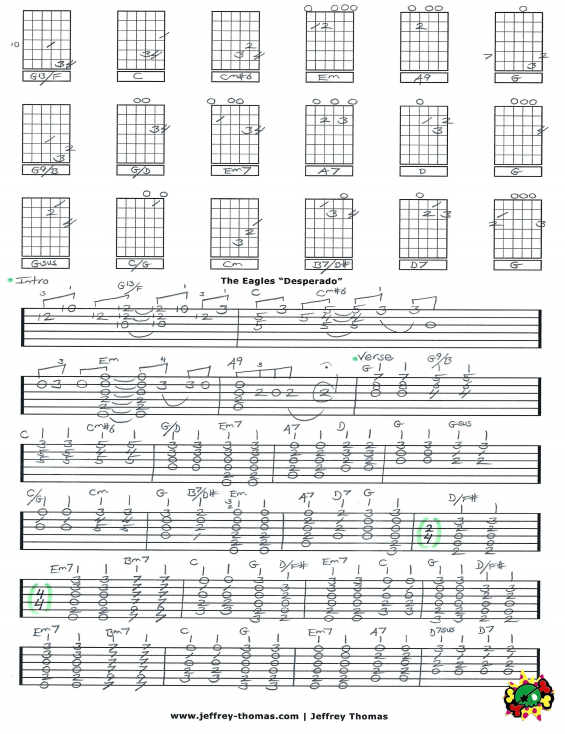 The Eagles Desperado Free Guitar Tab by Jeffrey Thomas. I have transposed the piano from the original recording to the guitar creating a unique custom guitar tab. Many of my students have requested Desperado in the past so I finally took the time to get it right. This version is perfect for accompanying a singer or on it’s own. Want the full guitar tab for free? Just send you email address on the form provided and I will send it to you. Need more help with the song? Fill out the Schedule A Free Lesson form to set up your free Skype guitar lesson! “Desperado” was ranked #494 on Rolling Stone’s 2004 “500 Greatest Songs Of All Time.” Find more great online guitar tabs on my tab, video and blog pages.